Spider Identification is a skill which will prove to be valuable to many individuals, especially for those who live in areas where there are harmful spiders. However, spider identification is not always easy because many different types of bugs look like spiders, plus spiders themselves come in a multitude of variety ranging from those as big as dinner plates to ones so small they can barely be seen. To properly identify spiders, one must know first what are spiders and what differentiates the common harmful spiders to harmless ones. Spider Identification – What are Spiders? Spiders are technically arthopods that breathe air. They are from the order Araneae, the largest group in the universe of arachnids. Among all creatures, they are one of those with the most diversity of species, with a rank of seventh among all the groups of organisms. To easily identify a spider, look for these: they have two body parts, the body and the head plus eight legs. They kill prey by injecting them with venom and digest the prey by injecting it with a fluid which liquefies the inside of the prey so they can easily eat or slurp it up. Spiders can be found in almost every continent in the world, with the exception of Antartica. They have been around for over 300 million years and one of the best organisms to have mastered survival. Spider Identification can be a bit of a predicament for those who are not familiar with their features. First of all, spiders are not insects and there are at least two more groups of organisms with spider-like features, the solifugae and the scorpions. Spider Identification General information Spiders have two segments, the head and the body. They can easily be identified but then, the inexperienced may have a problem in spider identification because differentiating them from solifugae or camel spiders and scorpions may require closer observation and knowing the details of general information on spider identification. Solifugae or Camel Spiders are not spiders although they look like one. They have two segments, the body and the head. They look like a cross between a spider and a scorpion but are not lethal as they do not have any venom. Scorpions at first glance may look like a spider, especially if the tail is not raised. However, scorpions have 3 marked segments, the head, body and the tail. Oftentimes, the head and body looks like one body part. Number of Legs Spiders have eight legs which are often longer than the legs of camel spiders and scorpions. A camel spider appears to have ten legs but only eight are real legs. The uppermost two are their long pedipalps. Scorpions have eight legs, the two nearest to the head end in pincers like a crab’s. Identifying Feature Spiders spin silk. Not all spiders spin silk all the time but it’s a giveaway feature to identify a spider. Solifugae will hide from the sun and will chase any source of shade. They also have strong chelicerae which can crush exoskeleton and small bones of prey. A tail that curves up which ends in a venom sac. 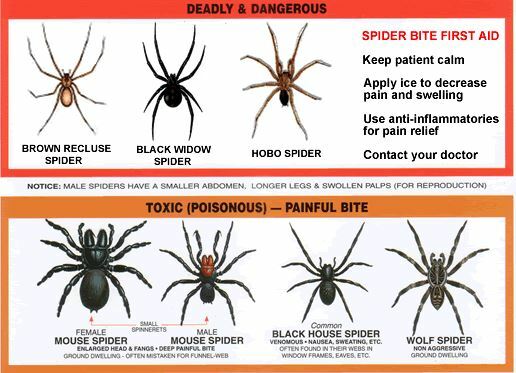 Below is a comprehensive table spider identification information of northern American spiders which can be found in houses and common human habitat areas. Black Widow Toxic bite which is potentially fatal. Seek medical attention as soon as bitten. Females are shiny and black and have a red hourglass shape on their abdomen which is the famous mark of the black widow. Males are often dark gray or brown with an hourglass shape on their abdomen which is usually color white or yellow, making spider identification of male black widows a bit confusing. Both sexes have strong venoms, but females have more potent venom which is thrice as deadly compared to males. They are feared as one of the most deadly among the types of spiders. Usually found in dark places like closets, barns, garage, inside shoes, crawl spaces, woodpiles, in between furnitures and angles of windowpanes. Black widows are very common all over the United States. Yellow Sac Spider Venomous non-fatal bite Can come in usually pale colors ranging from yellow to beige and spider identification can be by its distinctively long two front legs and all legs have tips which are darker than the rest of its coloring. They can be difficult to see because if their pale coloring compared to the rest of the types of spiders. Usually found in undisturbed places like cupboards, back of furniture, under baseboards, in ceilings, and woodpiles. Yellow sac spiders are very common all over the United States. Wolf Spiders Venomous non-fatal bite Can come in a variety of colors and sizes. The very distinctive characteristic is the female carries its egg sac and when the baby spiders hatch, the female wolf spider carries them on its back, making spider identification with this type very easy if you spot a female. Wolf spiders is the only one among the types of spiders that carries its young on its back. Usually found in the ground, like in gardens and wooded areas and can sometimes wander into the home. Wolf Spiders can be found all over the United States. Hobo Spider Venomous non-fatal bite Can be colored dark orange to brown and have a pale colored mark on the breastplate. Has a V-shaped mark across the abdomen in a lengthwise arrangement. The legs have dark bands which makes them look striped. The body is distinctively funnel-shaped. The hobo spider looks like the Domestic House Spider but the Hobo is easily identified by a light colored stripe that runs down the middle of its sternum. This feature makes Hobo spider identification a bit easier. They are actually very common in Europe and were only just imported in the United States around the 1930s. -Usually found in rarely disturbed places like the cupboards, behind furnitures, garage, basements, and attics. Hobo spiders are fairly common in the west coast, particularly the southern part. It is absent in the east coast though. Jumping Spider Non-toxic bite Can come in a variety of sizes and colors. Spider identification is easily done by their jumping behavior. Has 8 eyes that are arranged in two distinct rows of four eyes each. They can use their silk to build tents to shelter for themselves especially for winter. This is a distinct characteristic which can also be used for spider identification. They also use their silk to build cases for their eggs which they attach to sheltered areas and spaces. Usually found in folds of drapery and curtains, in sheets, in between books, and underside of molding and doors. Jumping spiders are very common all over the United States.